I have emailed this off to Whale and Pine who are a company selling prints of "Exclusive handpicked Artwork, Prints, and Accessories created by selected artists, illustrators and designers". They have a competition running: "Open Call to all artists, designers and illustrators around the world to create an amazing and decorative piece of art that people would love to hang on their walls. 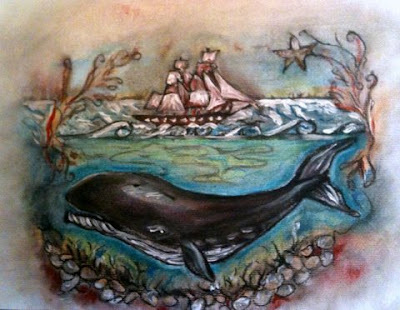 Subject: A Whale in your style. It can be anything from a Narwhal to an Orca. We are looking for imaginative, stylish and fresh approach to a scene composed around our protagonist". So this my attempt. they only have about 16 or 17 artists whose work they currently sell and my work isn't really in the same style, but even if all I get is a bit of feedback, it was a good exercise in working to deadline and to a "commission" of sorts. If I can do another one before the extended dealine of 30th November (tomorrow!) I might just email that off too. I'll really try to be less messy and leave more white spaces left on the page! 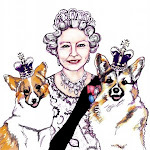 Well I have managed to do a second picture today and just emailed it off to them. But I thought I'd just share the starting point and inspiration for it, and the process of coming to finsihed result. I started with a piece of wrapping paper from my birthday that I had kept, in the style of a tattoo such as Amy Winehouse's (it says they tried to make me go to rehab. . .) - I cut the design out and kept it because I liked it. 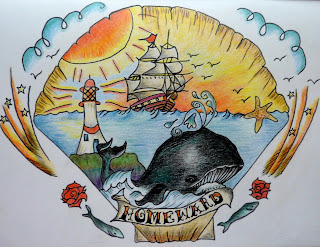 That got me thinking, navy, old sea dogs, sailors, etc, they all have tattoos and because the picture was to be a whale and that means the sea, a ship etc, bit like the first picture. But this time tattoo inspired - I also flicked through a book I have of 1000 tattoos to gen up on the styles and techniques. 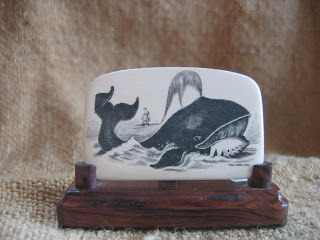 For the whale I found a scrimshaw carving to use as inspiration. 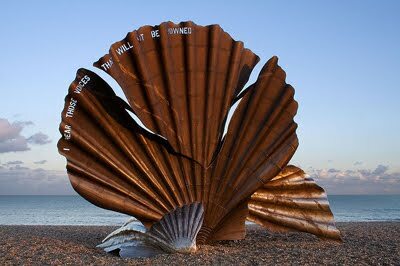 The scallop shape was a kind of nod to Maggie Hambling's Scallop on Aldeburgh beach. 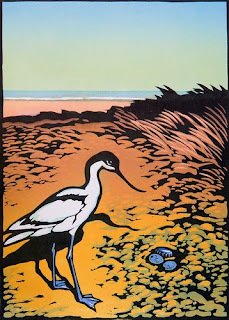 As I was drawing I realsied that the picture started to remind me of the Adnams beer artwork for their ads, it must have been subliminal due to the fact that Southwold where it brewed is just up the road from Aldeburgh. !